Scientists recently discovered an extremely hot planet with average surface temperatures hotter than most stars -- including our own. Daytime temperatures on exoplanet KELT-9b, a gas giant nearly twice the size of Jupiter that lies 650 light-years from Earth, can reach up to 7,800 degrees Fahrenheit. To put that in perspective, our own sun's surface temperature is 9,941 F, just 2,141 F hotter than KELT-9b, which lacks the nuclear core that keeps our sun hot. "It's a planet by any of the typical definitions based on mass, but its atmosphere is almost certainly unlike any other planet we've ever seen just because of the temperature of its day side," said Scott Gaudi, professor of astronomy at The Ohio State University and co-leader of the study announcing the discovery of KELT-9b. So, where exactly does KELT-9b's insanely high temperature come from, if not a hydrogen-fusing core like our sun's? The exoplanet is likely so superheated because it orbits extremely close to its host star, KELT-9, which is the hottest known planet-hosting star and appears blue to the human eye. KELT-9b actually orbits so close to KELT-9 that it makes a full orbit every one and a half Earth days. Since the planet's atmosphere is constantly being blasted with high levels of ultraviolet radiation, the planet might even be shedding a tail of evaporated planetary material like a comet, according to NASA's Jet Propulsion Laboratory. Although it produces a pretty effect, the toll of cosmic radiation will likely spell death for KELT-9B. 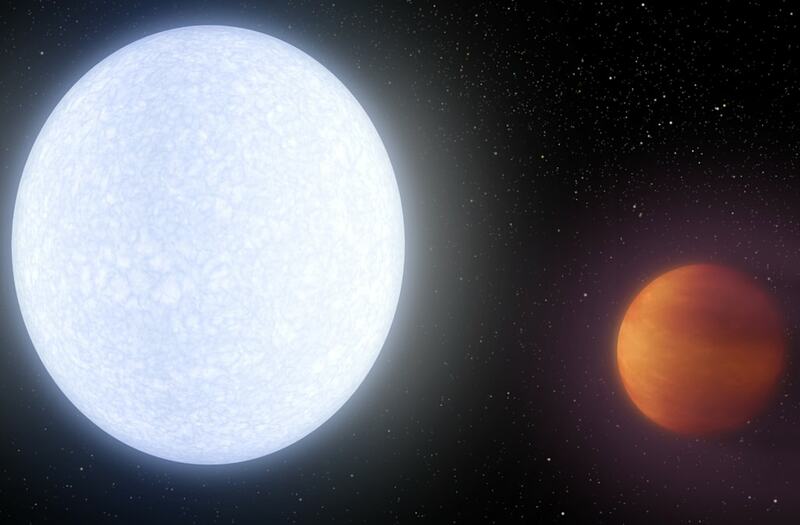 "KELT-9 radiates so much ultraviolet radiation that it may completely evaporate the planet," said Keivan Stassun, a professor of physics and astronomy at Vanderbilt University in Tennessee. "Or, if gas giant planets like KELT-9b possess solid rocky cores as some theories suggest, the planet may be boiled down to a barren rock, like Mercury."